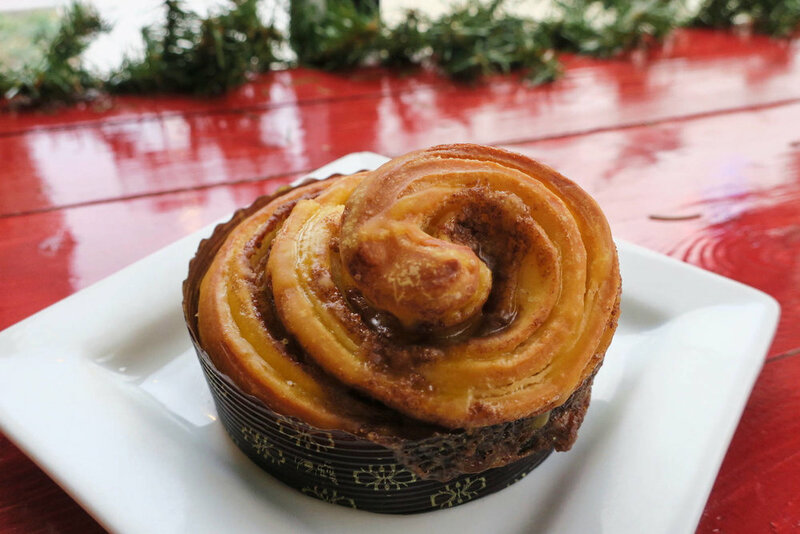 A few weeks before Christmas, I was really craving a cinnamon roll. But not just any grocery store or refrigerated cinnamon roll. I wanted one with a soft, sweet dough and a good cinnamon filling. Since I was in Kansas City, MO and had not ventured out much at all (too cold! ), I decided to see what the city had to offer in terms of cinnamon rolls. After some research, I decided to check out Brioche Pastry Shop located in the Crossroads Arts District. I was drawn to them because I noticed that their cinnamon rolls had a different look - they weren't drenched in sugar icing! I have never been a fan of large amounts of icing on cinnamon rolls. During high school, I would sit down and pick most of the icing off of the cinnamon rolls I would get from the vending machine. Even when I made refrigerated cinnamon rolls, I NEVER use all the icing included - it is just too much! I want to taste the ROLL not just globs of sugar. As soon as you walk into the shop, you are greeted with the aroma of cinnamon. I mean, it hits you as soon as you open the door and it was absolutely divine! It served as a perfect distraction for me from how COLD it was outside! Do you see how amazing these rolls look? The way they look doesn't compare to how they taste. I could hear the crackling of the puff pastry-type dough as I pulled the roll apart. The outer layer was flaky but the inside was soft - melt in your mouth, soft! If you look at the pictures closely, you can see the reflection of the light orange sugar glaze that gives the sweet roll its orange flavor. The combination of the orange glaze and buttery, flaky crust was nothing short of amazing! The flavors came together very well, with no one thing overpowering the other. As I worked my way through the roll, I found myself peeling it apart layer by layer and savoring each bite. I was absolutely in LOVE with this orange roll! Once I got to the end, I was literally picking at the layers stuck to the paper lining, LOL! Do you SEE the layers? Do you see the butter? After perusing the Brioche Pastry Shop website, I learned that the technique used for their rolls is a process called laminating, which means that several thin layers of dough are placed on top of each other and separated by butter. I don't know much about the process but I am definitely a fan of the result! Even though I ventured off course with what I was originally looking for, don't you worry - I still got my cinnamon roll fix. I purchased one of their Glazed Brioche Cinnamon Rolls for the road! It was a great decision for my taste buds but a HORRIBLE one for my waistline. And yes...it was just as amazing as the orange roll, especially since I warmed it slightly in the microwave☺. The light sugar glaze, cinnamon filling, and the same buttery, flaky dough used for the orange rolls was definitely worth the calories. I encourage you all to check out the rolls at Brioche Pastry Shop if you are ever in Kansas City. They have a winning recipe in my book!